Learning how to play in instrument can be a wonderful experience for a child, and many children begin the adventure with a great deal of enthusiasm. In fact, at first, children are normally more than willing to practice their instrument in order to learn how to play. But their enthusiasm for practicing can decline over time, making practice a real chore for both parent and child. There are ways to encourage your child to practice and even to make practicing fun. Consider the tips below to encourage your child to keep the music going. Make it Fun: Practice doesn’t have to be a grueling experience. In fact, parents can make practice fun for their child without much effort or time. 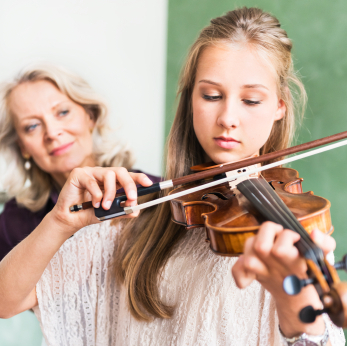 When your child sits down to practice, be sure you’re there to offer up encouragement and notice your child’s progress. The family pet can be encouraged to become a part of the audience, as can beloved stuffed animals or dolls. When your child is finished practicing, let her do something fun like play with friends, go for a bike ride or help you prepare dinner. By giving your child something to look forward to, you encourage your child to embrace practicing – and to have fun while doing it. Time it Carefully: The timing of your child’s practice schedule is important. Make sure you don’t ask your child to practice when he’s tired or overloaded with other responsibilities. It’s a good idea to schedule practice time at the same time every day. Sometimes mornings can be a great time to practice because your child is rested and not overwhelmed with homework or other extracurricular activities. Make practice a priority on the weekends before other commitments take over. Ask your child to practice before friends come over or before you begin your weekend activities or plans. Incentives: Children love to be rewarded for their efforts and a small incentive can encourage your child to keep practicing throughout the week. Give your child a practice goal to work towards (say 2 hours a week or whatever her instructor recommends) and when your child hits the benchmark, you can celebrate with a treat, or a play date to do something fun. Keep Track: It’s fun for kids to keep track of their progress. You can encourage your child to practice by providing a practice chart for them to track their time. After every practice session, give your child a sticker to place on the chart or calendar. Be Supportive: Taking the time to tell your child that you’re proud of his work and accomplishments can also encourage him to keep practicing and to continue to progress. Let your child know that learning an instrument can be difficult and challenging at times, but that the effort is well worth it.